Busy Pondweed has short leaves that are in groups of 2 or 3 on the stem and towards the top are in more dense clusters. Bushy Pondweed is also known as Southern Naiad. it has leaves that are dark green to greenish-purple, ribbon-like, opposite or in a whorl of 3, mostly less than 1/2 inch long and 1/8 inch wide. Flowers are at the base of the leaves but are so small that they can only be observed with magnification. Bushy Pondweed is often confused with Sago Pondweed but the leaves on Sago Pondweed are arranged oppositely in sheaths, while Bushy Pondweed has leaves arranged oppositely or in whorls. Southern Naiad is mainly on the Gulf and Atlantic Coasts, stretching from Oregon and then into Mexico and Central America. 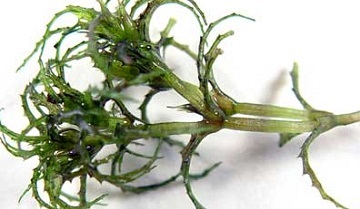 Treat Bushy Pondweed with Dibrox® or Spritflo® herbicides. Other alternative treatment products include: Navigate, Aquathol K, and Sonar. You can order this product on this website.